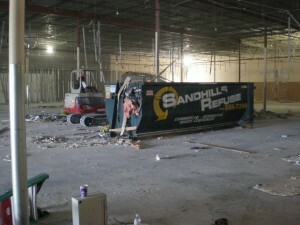 SANDHILLS ROLL OFF has several different dumpster sizes and dimensions. Choose the one that best suits the occasion and your requirements. If you are not sure about the right container, our staff will be happy to assist you to pick a container that meets your needs. We also provide portable toilet rental for your special event or business. Our portable restrooms are well equipped and clean. We offer same day service and weekend specials. 10 Yard Roll off – $250 per pull. Includes .5 tons of debris. 12 Yard Roll off – $275 per pull. Includes 1 ton of debris. 15 Yard Roll off – $325 per pull. Includes 1.5 tons of debris. 20 Yard Roll off – $375 per pull. Includes 2 tons of debris. 25 Yard Roll off – $425 per pull. Includes 2.5 tons of debris. 30 Yard Roll off – $475 per pull. Includes 3 tons of debris. 40 Yard Roll off – $525 per pull. Includes 3.5 tons of debris. Above rates apply for Aberdeen, Pinehurst, Whispering Pines and Southern Pines only. If you live outside this area call for rates. Please contact Mike to discuss your specific needs! FREE DELIVERY for Aberdeen, Southern Pines, Whispering Pines and Pinehurst. We can provide multiple dumpsters at your site and service them daily! We are #1 in service! Extra cost handling items: The following items are allowed but due to recycling, they need to be separated into special areas at the landfill. Items will be charged at $10 each. Substances hazardous to health such as toxic or corrosive materials or liquids. Any liquids of any kind whether contained or not, paint should be poured out onto cardboard or blankets etc and dry before loading into dumpster. Cans, drums or other containers of any kind unless they are empty and crushed; so incapable of carrying any liquid. Medical waste or animal carcasses of any kind or quantity. Any other material not listed above however considered unsuitable for containment e.g. malodorous waste; including but not limited to asbestos, paint, tires, gas bottle, fridges, freezers, TVs, fluorescent tubes, light bulbs, vehicle batteries, computer monitors,mattresses, liquids and solvents. These items will be charged extra. Don’t fill any dumpster higher than the top of its sides and in such a manner as to prevent spillage of material from dumpster either while stationary or in transit. Light fires in the dumpster. Customer is responsible for any damages to the container other than normal wear and tear while it is in the customerʼs possession. **Attention** Extremely heavy materials such as dirt, rock, concrete or trees. **Please let us know and we can help you dispose of such heavy items in a more cost effective manner. We have other dump sites for heavy material,tree debris and organic waste. Local landfill rate changes are beyond our control, and usually increase yearly. Sandhills Roll Off Dumpster Rental is always striving to be “GREEN”, therefore some items can be recycled for free, donated or composted and will not have dump fees or reduced fees if possible. All our vehicles have GPS tracking and mapping which help us get to you faster! Same day service is our specialty ! Located at 1050 N.May Street in beautiful Southern Pines. When you’re the most efficient and affordable dumpster rental service, there’s only one name to rely on: Sandhills Roll Off !